I’m always getting questions about the types of chocolate I use in my baking and finding myself telling people that they should try a different type of chocolate for theirs – so today, I’d like to talk to you about the different types of chocolate you can use. Most chocolates are divided into the categories white, milk, semi-sweet, unsweetened, and dark. These categories are based on the cocoa to fats ratio in the chocolate. 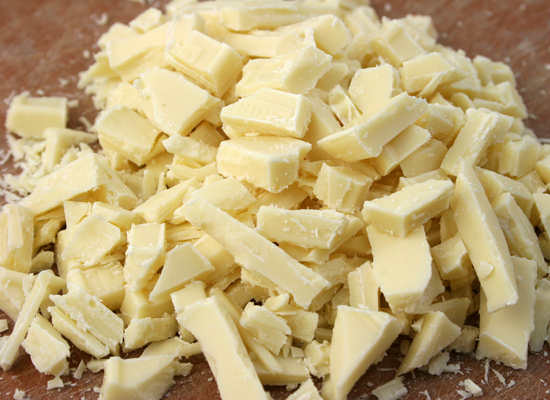 White chocolate is made completely out of cocoa butter, sugar, milk solids, salt and often a bit of vanilla. While it does contain cocoa butter (the fatty part of the bean), it doesn’t actually contain any of the cocoa powder ( nonfat part of the cacao bean). The large amount of cocoa butter and sugar make this the sweetest type of chocolate. But remember – not all white chocolate is made the same. White chocolate confectioner’s coatings, such as Almond Bark, are made from inexpensive solid or hydrogenated vegetable and animal fats, and are not derived from cocoa. Milk chocolate is basically a chocolate with a large amount of milk powder. The European Union requires that milk chocolate have at 25% concentration of cocoa solids. The US Government states that milk chocolate must have a 10% concentration of chocolate liquor (the ground or melted state of the cocoa nib). 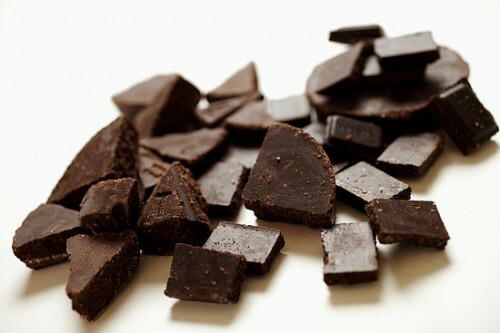 Semi-sweet chocolate is a chocolate that is made in the same way as milk chocolate without the addition of milk powder. It is most often found as chips or blocks in the baking aisle. At my house I have both standard chips and baker’s blocks in semi-sweet. Unsweetened chocolate is made almost entirely with a chocolate liqueur. The only fats added are there to make a solid substance. It looks like any other chocolate, but is super bitter. It is rarely used for anything other than being melted down to add to a baking recipe. That is why it is often called baking chocolate. 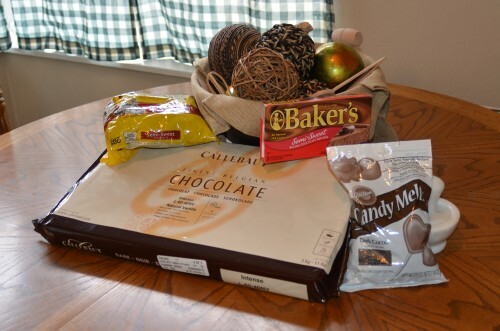 At my house, I only keep unsweetened chocolate in the form of Baker’s baking chocolate squares. Dark chocolate is my absolute favorite type of chocolate. However, not all dark chocolates are created equal. The U.S. has no official definition for dark chocolate but European rules specify a minimum of 35% cocoa solids. 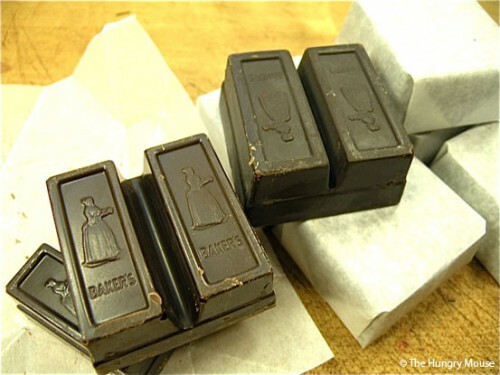 Dark chocolate can be eaten as is, or used in cooking, for which thicker, more expensive baking bars with higher cocoa percentages ranging from 70% to 99% are sold. 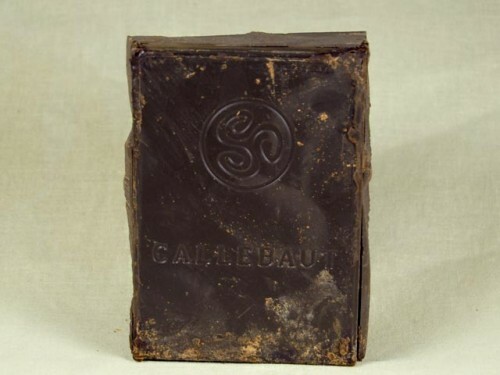 Dark chocolate is synonymous with semisweet, and extra dark chocolate with bittersweet, although the ratio of cocoa butter to solids may vary based on the brand. I personally prefer a 60% cocoa dark chocolate. 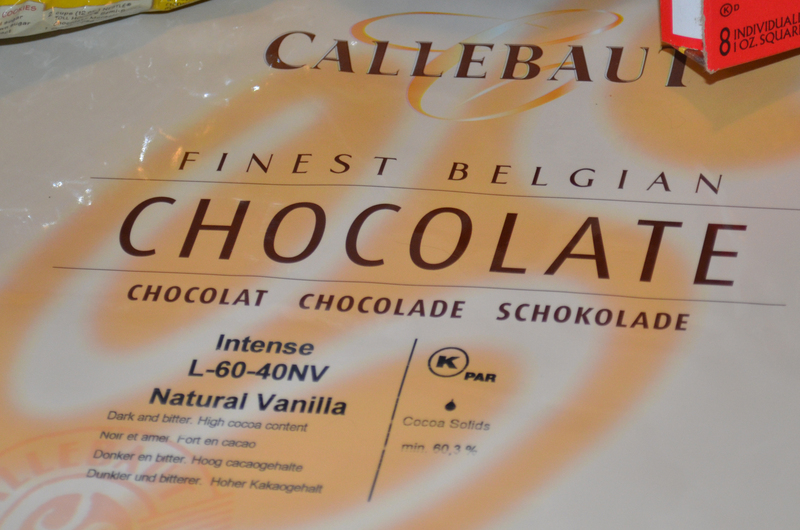 My favorite is the Callebaut Dark, which I buy in 11 lb bars. Now that we know how the amount of cocoa powder determines the type of chocolate, let’s talk about how you can get your chocolate. There are tons of chocolate products out there, but today I’m going to be covering the most commonly used: syrups, baker’s squares, chips , melts and eating chocolate. 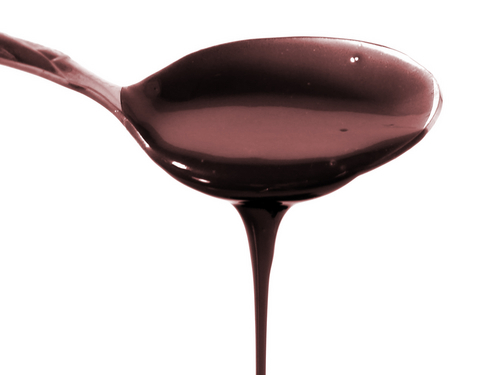 Chocolate syrup is simply a chocolate flavored condiment. These syrups are most commonly used as a topping for desserts, but are occasionally called for in a baking recipe. Chocolate Baking Squares come in all varieties of chocolate types from white to unsweetened, and everything in between. There are even specialty baking chocolate squares like German Chocolate. 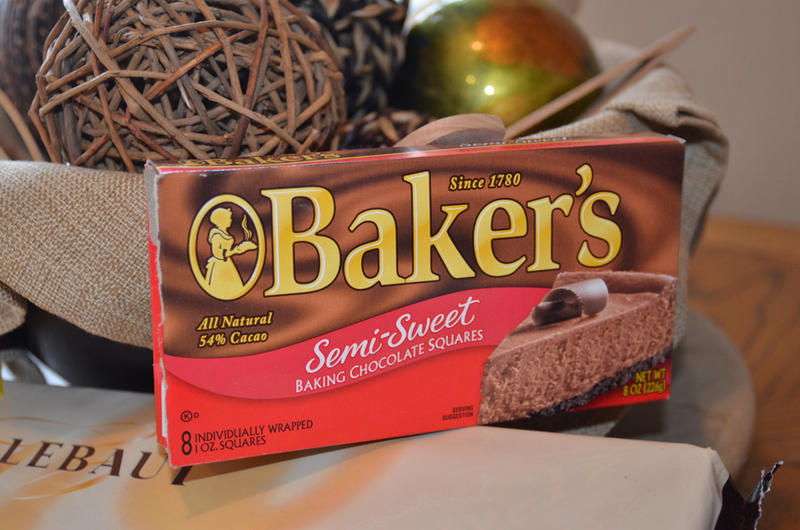 The most popular brand of chocolate baking squares is actually called Baker’s Chocolate. Their squares come in 1 oz. squares which divide down the middle into 1/2 oz. pieces. Most recipes that call for baking squares will list the number of squares, as opposed to the number of oz. 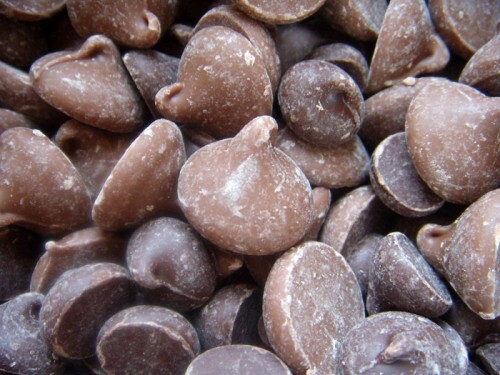 Chocolate Chips come in many varieties and not all of them are traditional chips. Traditional chips are shaped similarly to a Hershey’s Kiss, while chunks are irregularly shaped, and made to look like chopped eating chocolate. Most cookie recipes call for chocolate chips, because the chips are made in such a way that they continue to hold their shape through the baking process. While this will make your cookies look much more uniform, it is impossible to have chips that stay gooey after they cool. Melting Chocolate usually comes in large flat chips for easy, even melting. This chocolate often contains no real chocolate. Instead it uses solid or hydrogenated vegetable and animal fat instead of cocoa butter. 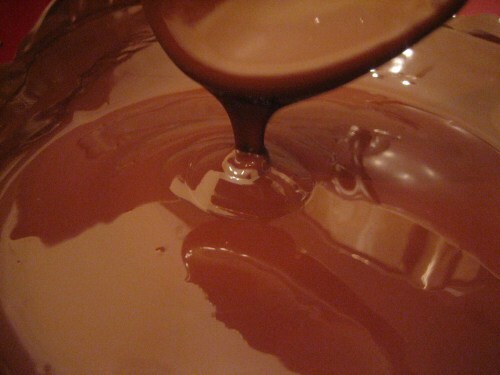 However, if tempered properly, most eating chocolates and chocolate chips can be used in lieu of melting chocolate. Eating Chocolate is quite simply the type of chocolate that you buy in the store to eat by itself. Because this chocolate is made to eat by itself, it often has a better flavor than other types of chocolate products. Eating chocolate can also be used to replace your basic chocolate chip in cookies. Using the eating chocolate in lieu of chips will leave you with a cookie that has gooey chocolate pieces long after the cookie has cooled. Eating chocolate can also be taken through a tempering process (which allows it to re-harden) and used as a dipping chocolate. Of course, there’s nothing wrong with using it for it’s original purpose and just eating it either. Now we know what the different types of chocolate are, based on the levels of cocoa they have in them; and we know what different types of chocolate products are commonly used for. So where do we go from here. Most likely, if you are over the age of 12 you have decided what your favorite type of chocolate is – though this is known to change as you get older. For me, I prefer a 60% or more dark chocolate. So, since i know what level of cocoa I want, I buy that when I purchase everything from syrups to chips and eating chocolates. But, that’s not to say that I use much melting chocolate or chips. I have found, through a recommendation from a friend and a little trial and error, that I prefer to use eating chocolates instead of chips and melting chocolates whenever possible. Now, it does mean a little more work. 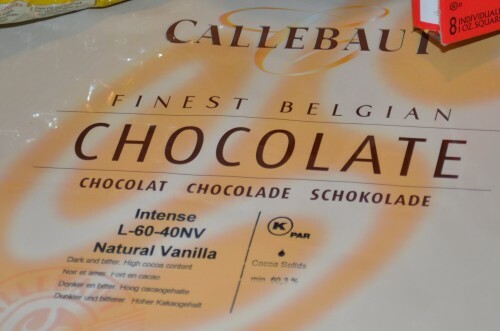 I buy my chocolate wholesale from a local restaurant, in 11 lb. 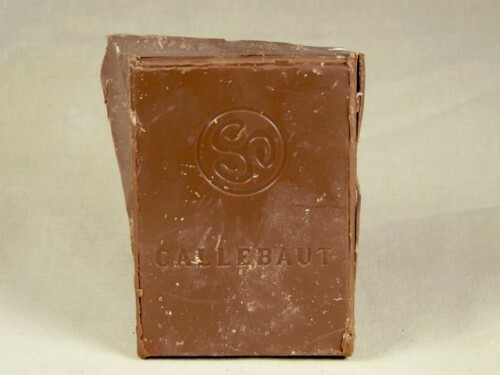 blocks – so for me, using this eating chocolate instead of chips means processing my bar by breaking it into usable pieces and then chopping those pieces into chunks needed. Using eating chocolate instead of melting chocolate takes even more work still. To use it instead of melting chocolate, it must be tempered, which is a rather lengthy process involving heating and lowering the temperature of the chocolate so that when the chocolate is allowed to cool completely it will re-harden, without blossoming (getting those white patches). What type of chocolate is your favorite? Do you have a favorite chocolate product? ← Previous Previous post: It’s a sparkly cookie sort of day.